Tapestry crochet is similar to regular crochet, except that more than one yarn is used at the same time to create a colorful fabric. Actually, one or more yarns are carried while another yarn is single crocheted. The finished pieces look woven instead of crocheted. Tapestry crochet has been popular for a long time in several countries. Mayan men in Guatemala tapestry crochet shoulder bags with cotton thread or wool yarn. In other parts of the world, tapestry crochet is used to make yarmulkes and hats. This purse begins at the bottom, then spirals upwards to the strap. 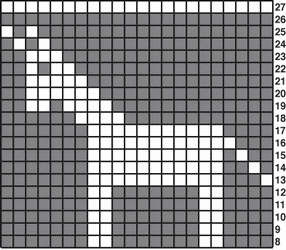 The horse is 22 stitches wide. It is possible to make a variety of purse sizes by increasing or decreasing the length of the foundation chain by eleven stitches. 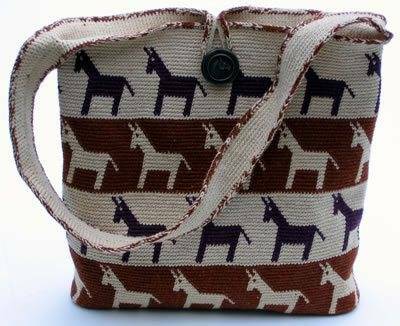 Feel free to substitute different colors or another motif — just be sure that the total number of stitches on the sides of the purse is a multiple of the number of stitches in your motif. All stitches are single crochet stitches unless otherwise indicated. Round 1: Starting with the brown thread, make a slip knot (leaving a ten-inch tail), then ch 75 sts. Increase or decrease in multiples of 11 chain stitches at this point to make a wider or narrower purse. Insert the hook into the second chain stitch from the hook, then sc in each of next 73 sts across, work 3 sc into the last chain for a total of 76 stitches. Continue to single crochet using the new top of the chain until you come around to the first stitch, carrying the “tail” as you go. To carry the “tail,” lay it over the stitches being crocheted into, then single crochet across as usual, crocheting under and over the thread. If done correctly, the carried thread will not be visible from the back or front of the work. Sc 2 stitches into the last stitch (the same stitch as your first single crochet). This first round should have a total of 150 stitches. Insert the stitch counter, or marker, into the top of the last stitch of this round (and move it to the new last stitch of each round as crocheting progresses). This piece is worked as a spiral, not in concentric rings, so DO NOT join. Round 2: Start to carry the bone color thread. Continue to crochet with brown. To keep the base flat, you will increase each round by 8 sts; 4 at each end. So begin this round by working 2 sc into the first st, 2 sc into the next st, 71 sc (one in each st), 2 sc into each of the next 4 sts, 71 sc (one in each st), 2 sc into the next st, then 2 sc into the last st of this round. The bag should have 158 sts when you finish this round. Round 3: Continue to crochet with brown while carrying the bone thread. Work 2 sc into the first st, 1 sc into the next st, 2 sc into the next st, 73 sts (one in each st), 2 sc into the next st, 1 sc into the next st, 2 sc into the next st, 2 sc into the next st, 1 sc into the next st, 2 sc into the next st, 73 sts (one in each st), 2 sc into the next st, 1 sc into the next st, then 2 sc into the next st. The bag should have 166 sts when you finish this round. Round 4: Continue to crochet with brown while carrying the bone thread. Work 1 sc into the first st, 2 sc into the next st, 1 sc into the next st, 2 sc into the next st, 75 sts (one in each st), 2 sc into the next st, 1 sc into the next st, 2 sc into the next st, sc into each of next 2 sts, 2 sc into the next st, 1 sc into the next st, 2 sc into the next st, 75 sts (one in each st), 2 sc into the next st, 1 sc into the next st, 2 sc into the next st, then sc 1 st into the last st. The purse should have 174 sts when you finish this round. Round 5: Continue to crochet with brown while carrying the bone thread. Sc 1 st into each of the first 2 sts, 2 sc into the next st, 1 sc into the next st, 2 sc into the next st, 77 sc (one in each st), 2 sc into the next st, 1 sc into the next st, 2 sc into the next st, sc into each of next 4 sts, 2 sc into the next st, 1 sc into the next st, 2 sc into the next st, 77 sc (one in each st), 2 sc into the next st, 1 sc into the next st, 2 sc into the next st, then sc 1 st into each of the last 2 sts. The purse should have 182 sts when you finish this round. Round 6: Continue to crochet with brown while carrying the bone thread. Sc 1 st into each of the first 3 sts, 2 sc into the next st, 1 sc into the next st, 2 sc into the next st, sc into each of next 79 sts, 2 sc into the next st, 1 sc into the next st, 2 sc into the next st, sc into each of next 6 sts, 2 sc into the next st, 1 sc into the next st, 2 sc into the next st, sc in each of next 79 sts, 2 sc into the next st, 1 sc into the next st, 2 sc into the next st, then sc 1 st into each of the last 3 sts. The purse should have 190 sts when you finish this round. Round 7: Continue to crochet with brown while carrying the bone thread. Sc 1 st into each of the first 4 sts, 2 sc into the next st, 1 sc into the next st, 2 sc into the next st, sc in each of next 81 sts, 2 sc into the next st, 1 sc into the next st, 2 sc into the next st, sc in each of next 8 sts, 2 sc into the next st, 1 sc into the next st, 2 sc into the next st, sc in each of next 81 sts, 2 sc into the next st, 1 sc into the next st, 2 sc into the next st, then sc 1 st into each of the last 4 sts. The purse should have 198 sts when you finish this round. Rounds 8 through 27 correspond to the illustrated motif (shown at left; read from right to left and bottom to top). The graph is for right-handed crocheters. Left-handed crocheters should use a graphics program to flip the image horizontally, or look at the reversed image of the graph in a mirror. You will begin to tapestry crochet the motif in the next round. To do a tapestry crochet stitch, colors are switched while 2 loops are still on the hook; so yarn over with the next color and pull it through the loops to prepare for the tapestry crochet stitch. Rounds 8 – 12: Crochet 4 background, 2 horse, 7 background, 2 horse, then 7 background stitches. Repeat this sequence around. Round 13: Crochet 1 horse, 3 background, 11 horse, then 7 background stitches. Repeat this sequence 8 times around. Round 14: Crochet 1 background, 1 horse, 2 background, 11 horse, then 7 background stitches. Repeat this sequence 8 times around. Round 15: Crochet 2 background, 1 horse, 1 background, 11 horse, then 7 background stitches. Repeat 8 times around. Round 16: Crochet 3 background, 12 horse, then 7 background stitches. Repeat 8 times around. Round 17: Crochet 4 background, 11 horse, then 7 background stitches. Repeat 8 times around. Round 18: Crochet 12 background, 4 horse, then 6 background stitches. Repeat 8 times around. Round 19: Crochet 13 background, 4 horse, 1 background, 2 horse, then 2 background stitches. Repeat 8 times around. Round 20: Crochet 14 background, 6 horse, then 2 background stitches. Repeat 8 times around. Round 21: Crochet 15 background, 5 horse, then 2 background stitches. Repeat 8 times around. Round 22: Crochet 16 background, 2 horse, 1 background, 1 horse, then 2 background stitches. Repeat 8 times around. Round 23: Crochet 17 background, 3 horse, then 2 background stitches. Repeat 8 times around. Round 24: Crochet 18 background, 1 horse, 1 background, 1 horse, then 1 background stitch. Repeat 8 times around. Round 25: Crochet 19 background, 1 horse, 1 background, then 1 horse stitch. Repeat 8 times around. Notice that the motif is slightly diagonal. This is normal, since tapestry crochet stitches are not exactly on top of the ones immediately below. Round 26: Crochet almost all the way around with background color stitches while carrying the horse color thread. Drop the horse thread and start to carry a different color horse thread for the last 10 stitches of this round. Round 27: Crochet around with different background color stitches while carrying the new horse color thread. Repeat Rounds 8 through 27. Repeat Rounds 8 through 26. Round A: Sc around with bone while carrying the horse color thread. Round B: Sc in each of next 16 bone stitches. Do not cut the bone thread, but do cut the carried horse thread flush. Chain 180 stitches with the bone thread (that is still attached to the purse). If you would like a longer or shorter shoulder strap, increase or decrease at this point. Insert the hook into the 99th stitch away from the base of the chain, connecting the end of the chain to the other side of the top of the purse with a single crochet stitch. Make sure that the chain is not twisted. Round C: Start to carry the brown thread. Single crochet across the top of the bag with the bone thread. Continue to sc onto the chain, while carrying the brown thread. Round D: Sc around with the bone thread, while carrying the brown thread. Round E: Sc 48 sts around with the bone thread, while carrying the brown thread, ch 30, then insert the hook into the next stitch (this chain will form a loop) and continue single crocheting around. Round F: Sc around with the bone thread, while carrying the brown thread. Sc 48 sts around with the bone thread, while carrying the brown thread, crochet onto the loop while carrying the brown thread, then continue to crochet around. Round G: Working with both threads joined together, sc around, then at the end of the round do a slip stitch, cut the threads (leaving 6 inch tails), then yarn over and pull them all the way through the loop. Weave in the ends for 2 inches to secure them, then trim them off. Round H: Turn over the shoulder bag. Have the side facing you with only one row of bone over the motif. Insert the hook into the stitch in the upper right hand corner of the purse next to the shoulder strap. Pull through a loop of bone thread, leaving a 2” piece hanging out of the back. Chain 1 with bone, then single crochet 1 stitch into the same stitch. Start to carry the brown thread along with the 2” piece of red thread. Crochet across the top of the purse. Continue to crochet onto the shoulder strap, inserting the hook into the bottom loops of the original chain. Rounds I, J, and K: Repeat Round D.
About Carol Ventura: While Carol Ventura served as a Peace Corps volunteer in highland Guatemala in the 1970’s, she was inspired by the colorful tapestry crocheted shoulder bags made there. Since that time she has explored the design potential of the technique, developed a system of diagramming patterns, and created a variety of flat and three-dimensional projects, which she shares in her tapestry crochet books and video. To order More Tapestry Crochet, please send a check or money order for $30 to Carol Ventura at 163 Big Spring Circle, Cookeville, TN 38501 (free shipping in the US and Canada). For more information about her books or tapestry crochet, please see www.tapestrycrochet.com. maybe email the horse graph to me that would be cool thanks again. My apologies – when I updated this page, I didn’t transfer the graph. If you refresh the page, you should it clearly now. If you click on the image it should appear in another window for quick printing. I hope this helps and I’m sure your purse will look lovely!